Dharma Trading Co. is happy to announce our own line of professional Acid Dyes for Silk, Wool and Nylon! While we have offered other acid dyes for years, we have decided to mix and package our own line of Acid Dyes in order to increase the range of colors and to lower prices for you. All 82 colors are brilliant, mouth-watering, and permanent. They don't fade, even after repeated washings. They are economical, safe, and easy to use. Superior to supermarket dyes in every way! Buy in small quantities, in bulk, or in kits. To purchase our new Dharma Acid Dye Poster of all 82 current colors click here! We've chosen to offer both easy to use common (basic) colors as well as more complex (advanced) colors that are harder to get and not normally available to the home dyer. People use these dyes in a wide variety of creative techniques including microwaving, baking, printing, spraying, painting, squirting, steaming etc. You will experience a lot of different results, color shifts, separation of color with mixes, etc. depending on the techniques you use. Learn to take Acid Dyes to the next level here. Wash items dyed with acid dye in cold water. For a dye for protein that is washfast even in hot water, see our new Dharma Lanaset Dyes. Silk and wool do not always come out the same color, plus monitors vary, etc., so when color or results are critical, test, test, test! To get the closest match to our color chart, for most colors tub dye at 1.5 - 2% of weight of goods (OWG), for colors with an * by their name, use at 4% OWG. Use more or less depending on the depth of shade YOU want. 2 oz. @ 5.10 8 oz. @ 15.40 1 lb. @ 27.15 5 lbs. @ 122.50 per lb. 10 lbs. @ 232.80 per lb. 2 oz. @ 6.55 8 oz. @ 19.49 1 lb. @ 35.35 5 lbs. @ 164.25 per lb. 10 lbs. @ 312.10 per lb. 2 oz. @ 3.60 8 oz. @ 11.25 1 lb. @ 19.45 5 lbs. @ 89.95 per lb. 10 lbs. @ 170.90 per lb. 2 oz. @ 5.95 8 oz. @ 18.10 1 lb. @ 32.90 5 lbs. @ 153.00 per lb. 10 lbs. @ 290.70 per lb. 2 oz. @ 5.95 8 oz. @ 17.68 1 lb. @ 31.95 5 lbs. @ 148.75 per lb. 10 lbs. @ 282.60 per lb. 2 oz. @ 5.80 8 oz. @ 16.99 1 lb. @ 30.49 5 lbs. @ 142.25 per lb. 10 lbs. @ 270.30 per lb. 2 oz. @ 5.90 8 oz. @ 17.10 1 lb. @ 30.99 5 lbs. @ 144.45 per lb. 10 lbs. @ 274.50 per lb. 2 oz. @ 5.30 8 oz. @ 15.60 1 lb. @ 28.30 5 lbs. @ 131.50 per lb. 10 lbs. @ 249.90 per lb. 2 oz. @ 4.25 8 oz. @ 12.75 1 lb. @ 23.20 5 lbs. @ 108.25 per lb. 10 lbs. @ 205.00 per lb. 2 oz. @ 6.75 8 oz. @ 21.35 1 lb. @ 38.99 5 lbs. @ 179.95 per lb. 10 lbs. @ 341.90 per lb. 2 oz. @ 5.10 8 oz. @ 15.45 1 lb. @ 27.25 5 lbs. @ 123.50 per lb. 10 lbs. @ 234.70 per lb. 2 oz. @ 3.95 8 oz. @ 12.25 1 lb. @ 21.49 5 lbs. @ 99.95 per lb. 10 lbs. @ 189.90 per lb. 2 oz. @ 3.80 8 oz. @ 12.15 1 lb. @ 20.40 5 lbs. @ 92.00 per lb. 10 lbs. @ 174.30 per lb. 2 oz. @ 4.95 8 oz. @ 14.95 1 lb. @ 26.95 5 lbs. @ 122.25 per lb. 10 lbs. @ 232.30 per lb. 2 oz. @ 5.90 8 oz. @ 17.20 1 lb. @ 31.35 5 lbs. @ 145.65 per lb. 10 lbs. @ 276.70 per lb. 2 oz. @ 5.60 8 oz. @ 16.25 1 lb. @ 29.49 5 lbs. @ 137.45 per lb. 10 lbs. @ 261.20 per lb. 2 oz. @ 4.95 8 oz. @ 14.52 1 lb. @ 26.40 5 lbs. @ 121.85 per lb. 10 lbs. @ 231.50 per lb. 2 oz. @ 4.65 8 oz. @ 13.60 1 lb. @ 24.70 5 lbs. @ 114.95 per lb. 10 lbs. @ 218.40 per lb. 2 oz. @ 2.25 8 oz. @ 6.45 1 lb. @ 10.95 5 lbs. @ 52.50 per lb. 10 lbs. @ 99.80 per lb. 2 oz. @ 3.55 8 oz. @ 10.50 1 lb. @ 17.50 5 lbs. @ 83.15 per lb. 10 lbs. @ 158.00 per lb. 2 oz. @ 4.25 8 oz. @ 12.50 1 lb. @ 22.79 5 lbs. @ 102.25 per lb. 10 lbs. @ 194.30 per lb. 2 oz. @ 5.35 8 oz. @ 15.70 1 lb. @ 28.54 5 lbs. @ 132.70 per lb. 10 lbs. @ 252.10 per lb. 2 oz. @ 2.50 8 oz. @ 6.60 1 lb. @ 11.50 5 lbs. @ 54.75 per lb. 10 lbs. @ 104.00 per lb. 2 oz. @ 6.45 8 oz. @ 18.84 1 lb. @ 34.25 5 lbs. @ 159.25 per lb. 10 lbs. @ 302.60 per lb. 2 oz. @ 4.85 8 oz. @ 14.15 1 lb. @ 25.75 5 lbs. @ 119.95 per lb. 10 lbs. @ 227.90 per lb. 2 oz. @ 6.35 8 oz. @ 20.25 1 lb. @ 33.95 5 lbs. @ 157.50 per lb. 10 lbs. @ 299.50 per lb. 2 oz. @ 2.50 8 oz. @ 6.10 1 lb. @ 11.50 5 lbs. @ 54.75 per lb. 10 lbs. @ 104.00 per lb. 2 oz. @ 4.45 8 oz. @ 13.20 1 lb. @ 24.00 5 lbs. @ 111.60 per lb. 10 lbs. @ 212.00 per lb. 2 oz. @ 5.50 8 oz. @ 15.99 1 lb. @ 28.99 5 lbs. @ 134.95 per lb. 10 lbs. @ 256.40 per lb. 2 oz. @ 7.39 8 oz. @ 22.66 1 lb. @ 41.66 5 lbs. @ 190.50 per lb. 10 lbs. @ 362.00 per lb. 2 oz. @ 6.65 8 oz. @ 19.95 1 lb. @ 36.45 5 lbs. @ 169.25 per lb. 10 lbs. @ 321.60 per lb. 2 oz. @ 4.80 8 oz. @ 13.99 1 lb. @ 25.64 5 lbs. @ 119.25 per lb. 10 lbs. @ 226.60 per lb. 2 oz. @ 3.65 8 oz. @ 11.75 1 lb. @ 19.65 5 lbs. @ 91.00 per lb. 10 lbs. @ 172.90 per lb. 2 oz. @ 5.70 8 oz. @ 16.40 1 lb. @ 29.95 5 lbs. @ 139.75 per lb. 10 lbs. @ 265.50 per lb. 2 oz. @ 4.95 8 oz. @ 14.75 1 lb. @ 26.50 5 lbs. @ 122.10 per lb. 10 lbs. @ 232.00 per lb. 2 oz. @ 4.55 8 oz. @ 13.32 1 lb. @ 24.22 5 lbs. @ 112.60 per lb. 10 lbs. @ 214.00 per lb. 2 oz. @ 5.95 8 oz. @ 17.58 1 lb. @ 31.75 5 lbs. @ 147.75 per lb. 10 lbs. @ 280.70 per lb. 2 oz. @ 2.65 8 oz. @ 7.50 1 lb. @ 12.65 5 lbs. @ 56.75 per lb. 10 lbs. @ 107.80 per lb. 2 oz. @ 3.65 8 oz. @ 11.50 1 lb. @ 19.65 5 lbs. @ 91.50 per lb. 10 lbs. @ 173.90 per lb. 2 oz. @ 6.50 8 oz. @ 19.75 1 lb. @ 34.99 5 lbs. @ 162.75 per lb. 10 lbs. @ 309.20 per lb. 2 oz. @ 2.95 8 oz. @ 9.50 1 lb. @ 15.75 5 lbs. @ 72.50 per lb. 10 lbs. @ 137.80 per lb. 2 oz. @ 4.25 8 oz. @ 13.75 1 lb. @ 22.95 5 lbs. @ 102.50 per lb. 10 lbs. @ 192.50 per lb. 2 oz. @ 2.25 8 oz. @ 6.45 1 lb. @ 10.95 5 lbs. @ 52.50 per lb. 10 lbs. @ per lb. 2 oz. @ 6.50 8 oz. @ 19.75 1 lb. @ 34.99 5 lbs. @ 162.75 per lb. 10 lbs. @ 309.00 per lb. 2 oz. @ 3.39 8 oz. @ 9.72 1 lb. @ 16.75 5 lbs. @ 77.90 per lb. 10 lbs. @ 148.00 per lb. 2 oz. - Sorry, this item is temporarily sold out. 2 oz. @ 2.25 8 oz. @ 5.90 1 lb. @ 10.75 5 lbs. @ 49.95 per lb. 10 lbs. @ 95.50 per lb. 2 oz. @ 3.75 8 oz. @ 11.85 1 lb. @ 19.75 5 lbs. @ 91.25 per lb. 10 lbs. @ 173.40 per lb. 2 oz. @ 2.54 8 oz. @ 6.80 1 lb. @ 11.75 5 lbs. @ 56.25 per lb. 10 lbs. @ 106.90 per lb. 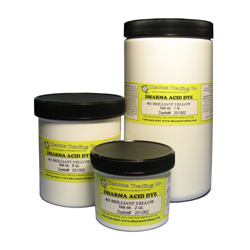 Dharma's own line of professional Acid Dyes for Silk, Wool and Nylon! While we have offered other acid dyes for years, we have decided to mix and package our own line of Acid Dyes in order to increase the range of colors and to lower prices. We have brought in some colors that are the same as other manufacturers, easy to use, with brilliant colors, at better prices. We have also brought in some colors not normally available to the home dyer that are more advanced and a bit more complex to use (Pre-metalized Acid Dyes), but offer better washfastness and lightfastness. For those of you who dye as an art form, we also chose these unique colors because they are extraordinary and hard to get. Traditional vat dyeing techniques of full immersion on the stove were used to develop the colors. People use these dyes in a wide variety of creative techniques including microwaving, baking, printing, spraying, painting, squirting, steaming etc. You will experience a lot of different results, color shifts, separation of color with mixes, etc. depending on the techniques you use. A large chart included under the Instructions link gives you more information and ratings for all the colors so you can make intelligent choices. Acid Dyes are concentrated powdered dyes for dyeing protein fibers and some Nylons (best for PFP or "prepared for printing" Nylon). The best choice for tub dyeing silk and wool fabrics, skeins of silk or wool yarn, feathers, etc. You can also paint or print with with it if you fix it by steaming. For tub dyeing, use these dyes on your stove or in a washing machine, keeping in mind that they do require very HOT water or steaming for best results. The only other thing needed is white vinegar for the fixative, or citric acid which is odorless. Acid Dyes react fast, exhaust well, and results for most colors are very lightfast and washfast. As with all powdered dyes or craft chemicals, handle with care and use good housekeeping procedures. Our color charts were done from wool dyeings, in a pot, on the stove. Silk and wool do not always come out the same color, techniques and water cause variation, plus monitors vary, etc., so when color is critical, test, test, test! Wash items dyed with acid dye in cold water. For a dye for protein fibers that is washfast even in hot water, see our new Dharma Lanaset Dyes. Click on the "Instructions" tab for complete instructions, very useful charts on the properties of the dye colors and a very helpful "trouble shooting" article. Keep in mind that an * by the name of a dye color (blacks and navy) indicates to use that color at 4% of weight of goods rather than 1.5 - 2% for the rest of the colors. Acid Dyes are the dye of choice for dyeing all protein fibers, like wool and other animal hair like alpaca, angora, mohair, etc., silk, feathers, and also they dye nylon. They are even used on leather sometimes. These concentrated powdered dyes are used primarily for tub-dyeing yardage or clothing, or tub dyeing or painting on protein yarns & roving. You can use these dyes either on top of your stove or in a washing machine but they do require very hot water to work properly. Washing machines don't get as hot, but do maintain consistent time, temperature and agitation, yielding more even results. If you are using them for direct application you would steam or microwave them. The only other thing needed (as a fixative) is household white vinegar or a mild powdered acid like Citric Acid which is actually more economical and eliminates the Vinegar smell. Textbooks and commercial dyers also talk about adding leveling agents to get the most even solid colors, like Glauber's Salt to Leveling Acid Dyes and using Ammonium Sulfate (used also for fertilizing plants) first, before the vinegar or citric, with Milling and Pre-metallized Acid Dyes, especially when dyeing paler colors. Check out our article - "Did you Know how Acid Dyes Work" if you are a really serious wool/silk dyer and really want to get into the chemistry and types of Acid Dyes and how they work. We have identified all the pure colors on the chart at the bottom of the page as to what type they are, although information out there is conflicting. Basically, the ones marked with an M or a P need a little more work and possibly Ammonium Sulfate to get more even "level" dye jobs. For low immersion dyeing, where you want lots of color separation (sometimes called "breaking", our mixes marked P are great! Also keep in mind that Milling and Pre-metallized Acid Dyes, while more difficult to work with, are more wash-fast and often more light-fast than Leveling Acid Dyes. On the color chart, the colors marked "Advanced", or marked with a + on the blue chart below, are pre-metallized mixes, and they tend to "split" the most, even more so than pure pre-metallized colors. Acid dyes are very economical, as they are very concentrated, react fast, and the results are very permanent for most colors (see chart below) - light and wash fast! The end color depends on your temperature, how much dye you use, how acid the dye-bath is, how long the fabric is in the dye, and how much fabric you have. Monitors and printed color charts can vary. Also, our color chart was done with a basic wool yarn. Silks sometimes come out lighter, sometimes even a different shade, so as with all dyes, it is important to test, test, test! If you have any problems after following the instructions, we have a "Dissolving and Trouble Shooting" segment we have written for you after much research. And as with all dye powders, you should handle them carefully. Common sense and good housekeeping (dust mask, gloves, proper ventilation, etc.) should always be used when handling any dye or chemicals. Keep out of reach of children and pets. We recommend always to pre-wash your fabric in hot water and something like Synthrapol or our Professional Textile Detergent to remove oils, dirt, silkworm gum, etc., even fingerprints, that will hinder an even dye job. Some wools require scouring. Yarns vary. But everything does need to be thoroughly wet before adding to dye-bath. Fill a stainless steel or enamel pot with enough hot or warm water for the fabric to swim freely, turn on the heat. Pre-dissolve the proper amount of dye powder for the weight of the fabric/yarn you are dyeing in about a cup of hot water (pyrex with a spout is great! ), then add to the pot and stir. If a color seems hard to dissolve, try a little boiling water. To get most of the colors on our dye color chart, we used 1/4-1/3 oz per lb of fabric (1.5-2% of the weight of the fabric - %OWG), which is approximately 2 1/4 - 3 level teaspoons (depending on the color - densities vary, so this is not an accurate method). To get a really dark Navy or a good Black, we used 2/3 oz/lb fiber (4% of the weight of the fabric or approximately 6 level teaspoons). For lighter colors, use less, for even darker than our color chart, use more. Add the fabric that has been thoroughly wetted to the dye pot. Raise the temperature to 185 for silk or up to 200 degrees for wool, just below boiling. Stir frequently for a few minutes to evenly distribute the dye. Add 1/4 cup of vinegar per pound of fabric. Try not to pour directly onto the fabric. Or add 1 Tbs. of Citric Acid per lb of dry fabric if you don't like the smell of vinegar. If you do a lot of dyeing, Citric Acid is also more economical. Again, for the Milling and Pre-metallized colors, try using 1 Tbs./lb of fabric of Ammonium Sulfate, which makes the bath go acid much more gradually, especially when trying to get level, even colors. Dissolve before adding to the dye bath. Add leveling agents like Glauber's Salt to the Leveling colors at this time also if you are going to use them. Then gradually add citric acid or vinegar towards the end to exhaust the dye more fully. Maintain temperature and stir frequently for 1/2 hour up to an hour for really dark colors. Regular stirring is even more important with the Pre-metallized and Milling colors. If a color isn't exhausting well, try adding more vinegar or citric acid. Some say a bit of plain salt in the dye bath also helps it to exhaust better. If you still have a lot of color left, take a note that you could try using less dye next time on that particular color. Wash in Synthrapol or Professional Textile Detergent and warm water to get out the excess dye. Never wash fibers dyed with acid dyes in hot water as it can break the bonds, which are not as strong as say, fiber reactive dye on cellulose fibers. Inform folks who buy your acid dyed silks and wools to dry clean or use cold water. Note: If you are dyeing wool, a gradual heating and gradual cooling of the dye--bath is important so as not to shock and felt the wool. These directions are for top loading washing machines only. We recommend always to pre-wash your fabric in hot water and something like Synthrapol or our Professional Textile Detergent to remove oils, dirt, silkworm gum, etc., even fingerprints, that will hinder an even dye job. At the very least, everything does need to be wet before adding to dye-bath. Set the washing machine to the hottest wash/cool rinse and longest wash cycle. Some folks say to turn your hot water heater to its highest setting first and let it heat up, especially when you are going for black and other dark colors, or they add some boiling water to increase the temperature. For silk, you are trying to get as high as 185 degrees F, although that is almost impossible with a washing machine. For dark colors it matters more than light colors. CAUTION - if you turn up your water heater, warn your family and don't forget to turn it back down after your dye-bath!!! Fill water to the lowest level appropriate for the amount of fabric being dyed, i.e., so it can swim freely but way more than that. Pre-dissolve the proper amount of dye powder for the weight of the fabric/yarn you are dyeing in about a cup of hot water (Pyrex with a spout is great! ), then add to the pot and stir. If a color seems hard to dissolve, try a little boiling water. To get the colors on our dye color chart, we used 1/4-1/3 oz per lb of fabric (1.5-2% of the weight of the fabric), except to get a really dark Navy or a good black, use 1 oz/lb fiber (4% of the weight of the fabric). For lighter colors, use less, for even darker than our color chart, use more. A full washing machine load can hold approximately 8 lbs of fabric, depending on how dense it is or how big the machine is. For 8 lbs of fabric, 1.5-2% weight of goods = 2 - 2.5 oz of most colors ( ~6 - 8 TBS or 1/3 - 1/2 cup, again, depending on the density of the dye), 4% weight of goods = 5 oz of dye for Dark Navy and Blacks (~16 TBS or 1 cup). Add clean wet fabric and agitate for a few minutes. Add 1-2 cups of vinegar depending on the size of the load and how dark you want the color, being careful not to pour directly onto fabric. Or add 1 Tbs. of Citric Acid per lb of dry fabric if you don't like the smell of vinegar. If you do a lot of dyeing, Citric Acid is also more economical. Again, for the Milling and Pre-metallized colors (see chart below), try substituting 1 Tbs./lb of fabric of Ammonium Sulfate, which makes the bath go acid much more gradually, especially when trying to get level, even colors. Dissolve before adding to the dye bath. Add leveling agents like Glauber's Salt to the Leveling colors at this time also if you are going to use them. Let agitate 15 more minutes or so, depending on the depth of color you want. Then gradually add citric acid or vinegar towards the end to exhaust the dye more fully. Let machine run through cycle OR for maximum wash fastness, stop and reset washer until your fabric has been agitating at least 30 min. to an hour for darker colors. Do not let the washing machine drain or start a new wash cycle. You just want to lengthen the time the fabric is in the dye bath. After resetting, let washer run through entire cycle including a cool rinse. To ensure that all of the excess dye has been removed, we suggest running the fabric through another wash cycle with cool to warm water and some Synthrapol or Professional Textile Detergent. Again, never wash acid dyed fabrics or garments in hot water as it can break the bonds of the dye and it will just continue to bleed. Run washer through a large rinse cycle to remove any excess dye in the washing machine. -Add 8 oz. (1 cup) of very hot water to one 1/2 oz. (for Black and a Dark Navy, use 1 oz.) of Dharma Acid Dye powder. Stock solutions can be stored up to 6 months in the refrigerator. Reconstitute by heating. -Stir until dissolved. This will yield a very concentrated dye stock solution. Most colors require further dilution. Note: Every color has a different solubility. Some colors are difficult to dissolve, but most are easily dissolved. A small amount of alcohol (about 1 tablespoon) can be added to the dye solution as a wetting agent, and boiling water can help dissolve also. The final concentration of the dye solution for painting should be between 4 and 8%. Start by adding 4 oz. (1/2 cup) of water to the 8 ounces of stock solution you have, test the color and continue adding water until desired shade is achieved. Keep in mind that the color intensity really develops in the steam setting process. Most colors will remain stable in solution for a long period of time. However, some colors will fall out of solution, and some might even congeal (especially some of the reds), upon cooling or from sitting for a matter of weeks. To restore them, simply heat them on the stove. Also keep in mind that some mixes of Acid dye colors, especially milling and premetalized dyes, can "separate" as they are drying and the colors migrate. Can be desirable, as it adds texture. If you don't want this, use the colors that we mark on the chart below with a color index #, as those are pure, unmixed colors. The traditional method of printing with dye is to add the dye to a thickener paste. This method can be used for screen printing, hand-painting, stenciling and stamping and many other direct application techniques. As with the methods above, it is important to prepare the fiber by washing to remove the sizing and anything else that might hinder the dye from penetrating. Wash, dry and iron the fabric. Prepare dye thickener paste (see below). Add dye, either powder or stock solution, as above, to thickener. Proportion the dye in the container in relation to the amount of thickener paste and desired intensity. Print, paint, or stencil or stamp on fabric. When screen printing with dye thickened with sodium alginate, the print base should be as thin as the image will allow. Dye printed in too thick a base will halo from the image before the fabric is cured or will accumulate in the corners, altering the image. Sodium Alginate SH is a high viscosity, low solids type of alginate thickener used primarily for cotton and other cellulose fibers. It may also be used for silk when fine line definition is not required. Sodium Alginate F is a low viscosity, high solids alginate used for silks and synthetics when fine line definition is desired. Use about 2 1/2 times more of the F to equal the viscosity of SH. Mix chemical water by adding 1/4 cup of urea and 1 Tablespoon of vinegar to 1 quart of water. Sprinkle sodium alginate over water and stir constantly for 10 minutes, OR mix in blender. Let stand for a few hours or overnight before using. Mixture may be stored in refrigerator for many months. Acid dyes will work on other things besides silk and wool. Basically anything protein, like feathers, fur, leather, etc. You just have to come up with a way to use it that won't ruin the substrate you are using it on - for example, leather doesn't like being simmered in a pot, it will just dry out. With feathers or leather, some folks paint it on, then steam it. These dyes also work on Nylon as it has a similar chemical structure. With Nylon, as with all fabrics, you must be sure there is no surface treatment that will interfere with the dye bonding with the fabric, i.e. : water repellents, stain resistance. So called PFP (prepared for printing) Nylon works best. The quantities recommended are for the deepest color saturation in one pound of fabric. For pastels and lighter colors, use less dye. For darker colors, use more dye. Any of the "pure" yellow, blue and red or fuchsia type colors can be used as primaries, but the chart below lists the most popular. Colors #406, 445 and #456 are pure Fluorescent and glow under black light. Our new colors #478 & #479 are Fluorescent Acid dyes mixed with another color (unfortunately, no such thing as a fluorescent blue), so they fluoresce, but not quite as strongly. For wash & light fastness higher numbers are better. For the less wash fast dye colors, of which we are carrying a couple so you have more color choices, Dharma Dye Fixative or Retayne in a final soak after dyeing helps a lot. Wash less wash fast colors in cooler water. Acid dyed silk and wool should be washed in cooler water anyway. Hot water breaks the bonds that make the dye permanent, and will cause the dye to bleed. All the dyes can be dry-cleaned. There are 3 basic Acid Dye types : L=Leveling, M=Milling, P=Premetallized 1:2 (see our article - "Did you Know how Acid Dyes Work" if you are a serious wool/silk dyer and want to get into chemistry and types of Acid Dyes and how they work). Some folks suggest mixing L colors with L colors, and M or P colors with M or P colors, because of the sizes of the molecules and how fast they travel through the water or the fiber (see below), if you want completely even dyeing. Leveling agents, as discussed above, help to solve that. There is also conflicting info out there as to whether some colors are L or M as some sources listed them as both. For low immersion dyeing, where you want color separation, you can mix any of them indefinitely! Colors below marked with an + are pre-metallized mixes that are having the most variation in color dependent on the conditions of the dyebath and other factors (see our trouble shooting guide). They tend to "break" the most, separating into their component colors, especially with low immersion techniques, which can be very visually interesting. We brought them in because they are beautiful and unique colors that are very difficult to achieve by mixing leveling or milling dyes, and have never been available to home dyers before. The Pre-metallized colors are also extremely washfast and lightfast. We think that once you get the hang of using them, they are worth it! If you want colors that are easier to use, we recommend you enjoy the other 49 beautiful colors. Just remember, if you want the color perfectly even or "level" when using any of the Pre-metallized colors or even the Milling colors, use ammonium sulfate at the beginning of the dyebath as described in detail above, and stir more than you would with the Leveling colors. Always, always add liquid to powder, not powder to liquid. Start with a cup of very hot (at least 180 degrees Fahrenheit) water and add about 1 tablespoon of that water to the powder. Smash the powder with a sturdy spoon while adding the liquid very gradually. This is called "pasting" the dye. We recommend this method for all colors. When it is a well-dissolved slurry, add the rest of the cup of water and stir vigorously. For hard to dissolve colors, try using hot Urea water (1-2 TBS Urea/cup water) instead of plain water, or water at boil temp (212 degrees Fahrenheit) to paste up the dye. Also, let it sit for awhile, like half an hour, before you use it. With hard to dissolve colors that might be in a mix, this step can actually effect the final color you get. To prevent freckling, strain your 1 cup solution into the dye bath water through something like thin pieces of silk (5 or 8mm Habotai works well) or fine nylon stockings placed in a funnel or strainer. If anything is left in the strainer paste it up with some more hot water and strain it again. Some colors in mixes dissolve much more slowly than the other color(s) and this solves that problem too. Experienced dyers will tell you it is worth this little bit of time to ensure a freckle free dye job! Also, because the raw colors, before U.S. manufacturers and distributors get hold of them and standardize them and make mixes with them, come from India and China usually, impurities like grains of sand or plastic particles are more common than they used to be years ago. Dharma makes sure all dye is sifted before packaging for this reason, but sifting doesn't catch everything. Straining the dye stock before using it is the next step. A great precautionary practice. Urea is also especially helpful when making concentrated dye for painting or other direct application. One of its functions, besides being a humectant, is to allow more solids to go into solution in less liquid. Very handy in the dye world. If you are using salt to help exhaust darker colors, add the pre-dissolved dye to the hot bath and mix well BEFORE adding salt. Salt reduces solubility, so if you do happen to have tiny particles of undissolved dye, they stand a better chance of going into solution without salt. If you are making stock solutions with your dyes remember to re-heat them before you use them. It is normal for some acid dye colors, especially Acid Red 266, to fall out of solution when the water cools, or even to thicken and gel when very concentrated. Heating will restore them. Only mix as much concentrate as you can use in about a months time, after that the dyes will get weaker and give less vivid results. Freckling - see the above instruction on dissolving the dye, and straining for the more stubborn colors. Freckles, or small spots of color, are caused by clumps of undissolved dye striking in a small area on the fiber. Forgetting to Pre-wet the fabric - always soak your fabric in some cool to warm water with a couple drops of Synthrapol before adding it to the dye bath. This will help the dye move through the fabric more evenly and help prevent areas from absorbing more dye then others. It will also help remove any fabric softener left on the material, which could inhibit dyeing. Not pre-washing - things like the above mentioned fabric softener, and even just oil from hands handling the silk or wool can cause splotchy dyeing, as well as silkworm gum, lanolin, machine oil, you name it. For level dyeing, fibers and fabric must be completely clean. Synthrapol or Dharma Professional Textile Detergent and hot water work well for this. Over-crowding the goods - This is the most common factor in uneven dyeing. When fabric is bunched up, the dye pools in the folds and creates dark patches. Using a larger pot and more water will help reduce this problem. Bunching and dye pooling into the folds also happens when you don't stir enough. Heating the bath too fast - It is best to slowly raise the temperature of the dye bath once the dye and fabric have been added to slow the striking of the dye and give the dye molecules time to move through the fabric. Once the water is up to temperature THEN add the acid. Remember is takes heat and acid to make the dye fix, so the more gradually you increase them the more even your results will be. Uneven heat - It is important to frequently (but gently!) stir and flip your fabric/yarn/garment so that one section does not spend more time at the bottom of the pot than the rest. The bottom section of the pot is the hottest and dye will strike faster in the hotter areas of the pot. Adding the Vinegar (or citric acid) too early - Acid Dyes need heat and an acidic environment to strike and fix to the fabric. If you add the vinegar to the pot right before you add the fabric, the first end of the fabric ends up darker then the rest because as soon as the fabric hits the water dye starts to fix to it. Add your dye, stir it for a minute or two then add your fabric. Stir your fabric around in the dye for 5-10 min (longer for really large items) and let the dye evenly penetrate the material while you are getting the dye bath up to temperature. When you add the vinegar, push the material aside and add parts of it to different sides of the pot, or even pull the fabric out while adding the acid. Then stir the whole thing very thoroughly to make sure it is evenly mixed in as the dye often "strikes" very fast once the acid is added, and the less the fabric is moving, the more unevenly the dye will strike. This is especially important when using the pre-metallized dyes. The type of Acid Dye used to mix the color (or the type of Acid Dye in the purchased mix) - Milling and Premetallized dyes are very wash fast but sometimes they need a bit of help from a leveling agent. Commercial dyers use leveling agents to get the most even solid colors, such as adding Glauber's Salt to Leveling Acid Dyes (L) and using Ammonium Sulfate (used also for fertilizing plants and easy to find at gardening stores) instead of vinegar or citric acid with Milling (M) and Premetallized Acid Dyes (P). This allows the dye to attach itself to the fabric for a much longer time before the dye bath turns acidic and the dye "strikes". This is because Ammonium Sulfate stays a fairly neutral PH until the dye bath reaches about 150º F. This can also be duplicated by the suggestion above of adding acid to the dye bath much later in the process. Check out our article - "Did you Know how Acid Dyes Work" if you are a really serious wool/silk dyer and really want to get into the chemistry and types of Acid Dyes and how they work. Mixes of Acid Dyes with widely different chemistry or molecular weight, like mixing a Leveling Acid Dye with a Pre-metallized Acid Dye - the smaller molecules travel through the material faster than the big ones, which can cause colors to "separate" or "break". This separation is more common when using low immersion or direct application techniques, where it can be used to great advantage, but can be sometimes be seen in a dye bath situation as well. Low immersion techniques where steaming or microwaving is used to set the dye - in these situations where you don't have much water, the dye is trapped in the creases and folds. The fabric stays in one spot instead of swimming freely and moving when stirred in the bath situation. Different sized dye molecules, depending on the colors in the mix, migrate slowly through the fabric at different rates. It is perfectly normal to get color separation and blotchy results using these tecniques. Artists use this to their advantage. Low immersion tecniques are normally used to deliberately get color separation, as with tie-dye "bleed" that you see with fiber reactive dye on cotton. It is part of the beauty of low immersion dyeing or tie-dye tecniques. An unexpected color is coming up from a mixed color - usually seen at the beginning of a dye bath, but sometimes the end result too. More common with techniques that don't utilize the entire length and sequence of events as a "normal" dye bath, like baggie dyeing, microwaving, painting, steaming, etc. Also a great way to discover wonderful new effects of different mix combinations. Often when you have a mix of 2 or more colors, the pure colors in the mix are of a different molecular weight, size or composition, and some colors "strike" faster than others, even if the mix is of the same type of acid dyes. If you have a leveling dye (small molecules) mixed with a pre-metalized dye (much larger molecules), the leveling dye will strike much faster than the pre-metallized. The color you were expecting might not come up until very late in the dye bath. With mixes like this, it is very important to add your acid late in the process or use Ammonium Sulfate instead of Vinegar or Citric Acid. As mentioned above, a mix might have a hard to dissolve color in it, which dissolves later than other colors in the mix. Letting a color like this sit for ~30 minutes after you paste it up, then adding some more hot water before you use it, can help. We have found some of the blues are harder to dissolve, so the greens can come up yellower, or the purples can come up redder, than they are supposed to. Allowing more time for the blue to dissolve seems to solve this problem. Your end color is also affected by many other variables - water, fiber content, physical attributes of the fiber, etc. If you dye two different fiber types in the same dye bath, one may grab a color in the mix much faster than the other, hogging it, so the other fiber can come out a different color entirely. More absorbant fibers can come out a different color than less absorbant fibers, silk different than wool, etc. Put silk and wool in together, and the wool will absorb the dye much faster than the silk, and in different proportions of the mix components. Throw 5 different brands or types of wool yarn in the same dye bath of a mixed color and see what happens. Hard water can also yield different color than soft water. Technique alone can determine color; colors may come out differently depending on whether you do a full dyebath, microwave in a baggie, paint and steam, etc. If you have taken all these things into consideration, you can see if a color is possibly "off" by doing a "controlled" test, where you follow the dyebath directions to the letter with proper timing and proportions using a piece of common wool or silk and distilled water, or use water softener if you have "hard" water. You have to do it from start to finish, including the pre-washing and wetting, and through the washout and drying. That is the only way to ever tell if the problem is the dye, or one or more of the numerous other variables that effect final color. Too much dye - Double check your formula. We used 1.5% - 2% weight of goods (OWG) to get most of our colors of Dharma Acid Dye, except Black and Deep Navy (4%). Jacquard Acid Dyes have a chart in their instructions with specific amounts recommended for specific colors, ranging from 1.5% OWG all the way up to ~18% for the darkest colors. At a certain point all the dye receptor sites on the fibers will be saturated. If you are happy with the color of the fabric pull it out and set it aside to rinse. Instead of tossing all the dye down the drain, stick some scrap fabric or yarn in and let it take up the rest of the dye. This is a great way to get new shades that may inspire a whole new project! Waste not want not. Also, some colors don't exhaust as well as others, but that does not mean you are not getting fixation. The color is not dark enough yet and the dye just doesn't seem to be striking or the dye bath is not exhausting - make sure you added your vinegar, even the best of us gets distracted by kids, pets, TV or a good sunny day. If you did add your vinegar but the water is still too dark and the fabric too light add some plain salt. 1/2 to 1 cup to start with, more for dark colors like black and navy. Also, you can add more acid to cause more dye to strike. The water is almost clear but not quite - turn the heat off and let everything cool down. As the water cools its solubility decreases and this is often enough to encourage the last bit of dye to head into the fiber and fix. It is also good safety to let things cool before you pull out your item for rinsing. Acid Dye is one of our most popular dyes. Here is a simple tutorial showing you how to make our yarn look like the ones you see in stores. Just want a nice solid color on Wool, silk, or other animal fibers? Here we tell you how to do it! 401 - Brilliant Yellow, 402 - Fire Engine Red, 407 - Caribbean Blue, 409 - Dark Navy*, 411 - Deep Magenta, 413 - True Black* and 2 lb. Citric Acid. I am a new dyer and have been experimenting withthese dyes for 5 months now. I have finally got a lot of the kinks out of the process. I use an electric kettle to get the water boiling hot to mix with the dye. That solved a bunch of headaches! Next with Fire Engine Red Navy and True Black I leave them overnight to finish exhausting and next morning rinse. The dye is completely absorbed and there is little to no bleed at all. I should add that I use double the amounts of dye in these colors to get the deep rich red navy and black. Works beautifully!! I still am not having luck withthe Peacock Blue though. It just won't dissolve no matter what I do. The Cayenne Red and Fire Engine Red do gel up when stored. I just heat them for 30 seconds in the microwave to take care of that. 103 of 104 users found this review helpful. When I began this yarn dyeing "hobby" I believed I could get by with one company's acid dye. I was wrong. Berry Crush is a fabulous example. It is my drop-dead go to berry color. I cannot duplicate it with a mix and even if I could the color is so close even with different lots there is no point. Dharma's True Black is unbeatable. It is my go-to black and the only one I use ever. No one else makes one that does not have an undertone I find unpleasant. Okay it's black it smells but not as horrible as some others. It overdyes almost anything with the Depth of Shade reachable to completely cover a bad dye job or to enhance another color and add depth. I use it in my Malachite Colorway all the time. I put Citric Acid Urea water and black in a spray bottle and spray it over a green I make for the dark lines in Malachite. The color behaves and kisses the green tonal with enough black to really make it look like the polished rock. Just a lovely effect. The Sapphire is better than most colors and truly reminds me of sapphires. I use that exclusively for a Sapphire Blue I use only on Alpaca mixes and am thrilled every time. The bleed is just not there as long as I don't overdo it and use the proper amount of acid. For one of the other dyers who said the Peacock Blue is hard to dissolve yes it can be. Try this. Mix Urea with 70% rubbing alcohol in a 5050 mixture I mix mine all at once but I use a one and two percent dye solution. I always mix the stubborn blues with heated but not boiling distilled water. I mix a paste and yes you can smell the alcohol in the mix but it goes away quickly paste it up with just enough water to wet my dye and let it sit that way for 10 minutes. I then add more water mix and let that sit. I finish with the rest of the water and stir till my arm feels like it cannot stir any longer. Allow it to cool cap it (I use glass ball jars that I sterilize) and shake prior to opening in a utility sink with gloves on. I can get it to mix perfectly if I do that. Yes it is a pain but the color is lovely and if you use Dharma you really need it. I've also found it behaves when mixed with other colors at the outset. If I want a green for example and Peacock is in the green I mix the yellow and green by weighing it in a container on a jeweler's scale. I still use alcohol when I mix (it helps preserve it a little and there is something in the rubbing alcohol mix that just helps mix the dye I could go tech on you but I know it but I'm not sure I could explain it properly) and it stays in mixture pretty well. I still shake the container with the lid on. If you do use canning jars allow the mixture to cool prior to capping. I didn't once and when I pried the sealed top open there was a color explosion in my sink over my gloves onto my apron and a mask was one of those things I really needed and was glad I was wearing. I do not use Dharma exclusively. I do go-to some of these colors both the primaries and mixes enough to really want to share my positive experience. I would never consider dropping the Espresso Bean from my line. The gorgeous purple undertone is not available anywhere else and it is so lovely. 83 of 83 users found this review helpful. Wow! Side by side trial with 3 companys and I have to say this dye Rocked! Nice nice black! 39 of 39 users found this review helpful. The value on these is great! I figured I'd give the "off" brand a shot and was pleased with both the volume of dye in the container and the luscious colors that resulted. 25 of 26 users found this review helpful. The colors that I have used are consistent no problems with dissolving or color shifting. The black is black. 24 of 24 users found this review helpful. I started dying a few months ago. The dyes are so bright and beautiful. The prices are good on top of everything. I've had so much fun. So much so I've ordered more yarn and am about to order more dye. I went in to my first dyeing attempt with dye-na-flow for ease and simplicity. However one outfit in it really faded. I tested colors with a bandanna and they looked good but with other dyeables which might not be pure silk but a blend they did not look good.So I quickly switched to these dyes to try them out. I also got the same long sleeve shirt as I tried with the dye-na-flow. First off it is very economical compared to the pre-mixed dyes. I am hand painting with the dyes and 18 tp of dye is plenty to handle a big long sleeve shirt with a lot of that color.As the description says this dye is much more vibrant than the paints that act like dyes. There is no feel on the fabric and no bleeding after steam setting.For steam setting I am doing a basic wrap with paper and putting it in a pressure cooker whistle off for one hour.Most dyes seemed to dissolve very easily in near boiling water and didn't have to be reheated. That fire engine red was a pain but could be reheated in microwave. Also I used 50% more the concentration for the red to get it looking red otherwise it was pink. The Dharma Acid Dyes are more consistent than the more expensive "name brand" that Dharma sells. The crystals dissolve easily (one exception) and exhaust well. I have a complaint about a specific color: 478 Purple Pop (fluor. )It is unfortunately unstable and has a fugitive dye problem. I have extensive experience dyeing fibers (20+ years) It's a fantastic color yet when dyeing such as wool roving it bleeds and bleeds...and bleeds some more. You can rinse 10 times and it will continue to puke out hot pink. It's truly unfortunate as I LOVE the color. It is stable on nylon. When it comes to merino or other wool...not as much. It works good as speckling agent when sprinkling dye power onto yarns. As a tonal this is where the problem is. I am ordering a new pot hoping that the first few batches were lacking. 10 of 11 users found this review helpful. I bought three colors to work with on some nylon skirts I've owned for years. These acid dyes were BRILLIANT on the Supplex nylon they dyed beautifully. It was my first time using the dyes so I was sure I'd make a mistake or at least one thing would come out blotchy but I just followed the directions on the website and it went swimmingly. I've got the fever now I want to dye everything! I have been dyeing yarn for a long time and I have always been a Jaquard person. Then I tried the Dharma acid dye. Ohhhhh wow! They dissolve faster have something like 800x the amount of dye for the money and have much higher adhesion rates than Jaquard. They are a million times better than another brand Greener something too. I am absolutely converted. I will be replacing all my Jaquard colors (which BTW Dharma has WAY more colors available!!) as soon as I run of each color. I am so impressed I want to shout it from the roof. Thank you so much!!!! I really like these dyes. It does take some heat to get some of them (Brilliant Yellow and Fire Engine Red) to dissolve. Like others have commented it is good to leave the dyepot sitting for awhile - even overnight - to help the dye exhaust. 11 of 11 users found this review helpful. fabulous acid dyes. my 7525 woolnylon just sucked up the colors and exhausted the dye!